Most air pollutants are damaging to human health. 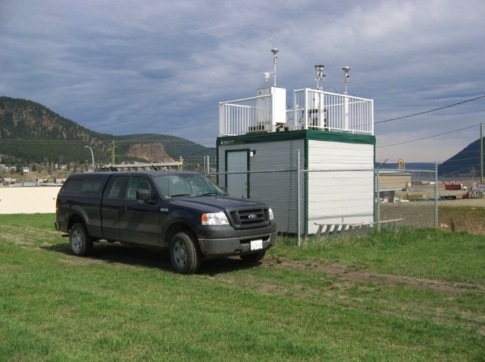 Whilst high profile air pollutants such as sulphur dioxide, carbon monoxide and ground level ozone are present in the Williams Lake Airshed, it is the high levels of suspended particulate matter (PM) that pose the greatest problem. As a general rule the smaller the particle inhaled, the further it is able to travel into the body. Airborne dust with a diameter of 10 micrometers (μm) – commonly referred to as PM10 – is easily inhaled and trapped, irritating the nose, throat and upper respiratory tract. Respirable dust is a quarter of the size of inhalable dust, with a diameter of less than 2.5μm (PM2.5) this smaller particulate matter is thought to be especially harmful as it easily travels to the deepest regions of our lungs. Composed mainly of secondary particles (formed from physical and chemical reactions involving gases such as oxides of nitrogen, sulphur and ammonia, and volatile organic compounds or VOCs), there are a growing number of studies linking the inhalation of PM2.5 with premature death. Suspended particulate matter is too small to register with the naked eye, however, it is clearly visible in our airshed when atmospheric concentrations reach sufficient levels to form a blue or brown haze. Sources of particulate matter vary from naturally occurring dust pollen and spores, to those originating from human activity such as industrial processes, back yard burning, home and commercial heating, car and truck emissions, and road and construction dust. Whilst the natural sources of particulate matter are difficult to control, we can however influence human sources: we can make a difference. Visibility explained - what is haze? Inhaled pollutants irritate, inflame or destroy lung tissue. Studies in B.C. associate at least 82 deaths annually with inhalation of fine particulate matter. Inhalation of particulate matter exacerbates heart and lung conditions and increases hospitalization of those suffering from chronic respiratory disorders such as asthma, bronchitis and emphysema. Check out the BC State of the Air Report. Published annually by the BC Lung Association’s Air Quality and Health Steering Committee, the BC State of the Air Report provides a snapshot of current air quality across the province, information about pollutants of greatest concern from a human health perspective, and the various actions underway in BC to address these issues.